I have to undergo that unspeakable medical procedure that folks of a certain age should do. Today is the no solid foods/purge day. I am allowed jello and clear liquids. I decided to make this as enjoyable as possible and brewed myself a pot of Twinings Irish Breakfast tea. I like this tea. So while not quite high tea as there are no biscuits or breads to nibble on I am still enjoying it. 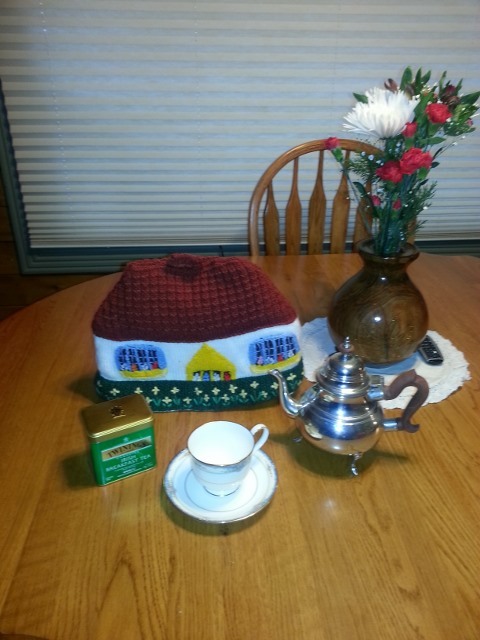 The tea cozy was made for me by an Aunt in the UK and is cherished. Enjoy the tea ... and good luck. Preventative health care is important! The stuff they put you out with is almost worth the discomfort of the prep and it's aftermath. It is the same stuff that killed Michael Jackson. Better than tea is beef Bullion today. It tends to fill you up .Jello is completely worthless. (12-02-2013, 08:01 AM)Barrylu Wrote: Better than tea is beef Bullion today. It tends to fill you up .Jello is completely worthless. Thanks for the tips. This is first time for me. I am following the procedure the doctors office gave me. I will try some beef bouillon. I figured come dinner time I would be starved and the jello would help me feel as if I actually ate something. (12-02-2013, 07:51 AM)Agravic Wrote: Enjoy the tea ... and good luck. Preventative health care is important! * Good luck with the procedure, Phil! Miso soup is also a good substitute! Phil, I have had the procedure done twice. It is basically a non-event and I have never understood the fear that folks seem to bring along with it. Stay healthy, my friend. As Ravi stated, preventive care is a good thing. I left Andy's office with some written instructions, and a prescription for a product called 'MoviPrep,' which comes in a box large enough to hold a microwave oven. I will discuss MoviPrep in detail later; for now suffice it to say that we must never allow it to fall into the hands of America's enemies..
1. Take it easy Doc.. You’re boldly going where no man has gone before. Barry, Dave Barry is one of my all time favorites. I even enjoyed his young adult series (along with Ridley Pearson), Peter and the Starcatchers, but what you posted here had me laughing so hard that I must have been heard three blocks away. Thanks for sharing. Well that is over. Not nearly as unpleasant as I was expecting. A little loopy from the anesthetic but overall doing well. Sitting here with a cup of PG Tips tea and toast and strawberry jam. Dave Barry got his start in the SE corner of PA where I grew up. Funny even back in early 80's. Made it onto Johnny Carson which was big big news. Glad to hear everything went well, Phil. Phil, I'm delighted it all went smoothly and I bet that tea was exceptionally delicious because you could have that toast and jam along with it.